Simpsons are relatively new kids on the dog food block but their new range of grain free, 80:20 foods have launched them right to the top of our dog food rankings with a perfect score of 5 out of 5 - one of only three companies to achieve such a feat! 80:20 means the food contains 80% meat products, 20% vegetables, fruits and natural supplements. It also means that the food is completely grain free, all of which will be music to the ears of many natural feeding advocates who believe that dogs should be fed on the same diet that their wild ancestors would have eaten. The enormous meat content is of the highest standard and comes from both fresh and dry sources all of which are provided with a clear percentage making it much easier for you and me to analyse the food accurately. The combination of fresh and dry meats is becoming more and more popular with manufacturers as the dry meat provides nutritional stability and keeps the moisture content down (which is important during processing) while the fresh meat increases palatability, is relatively inexpensive and makes the total meat content appear much higher. Once the excess water from the fresh meat has been taken out of the equation, along with the gravy, fat and egg, the actual meat content in the final biscuit is likely to be more like 50% but that's still plenty for any dog. Of course, so much meat inevitably pushes up the protein and fat levels, but since it is all from good quality meat sources, this shouldn't be a cause for concern for most dog owners. After the meat comes a whole host of highly nutritious vegetables, fruits, herbs and natural supplements. Sweet potato, lucerne (aka alfalfa), spinach and seaweed, to mention but a few, are all packed with valuable natural nutrients for dogs. Add to that the joint supplements, pre-biotics and wide array of nutritious herbs, and it's clear that Simpsons 80:20 really covers all of the bases. Considering its quality, Simpsons is also fairly well priced. Of course, there are a lot of cheaper foods but there are also plenty of more expensive options that don't come close in terms of quality and since you don't have to feed that much of Simpsons, the cost per day works out pretty favourably. 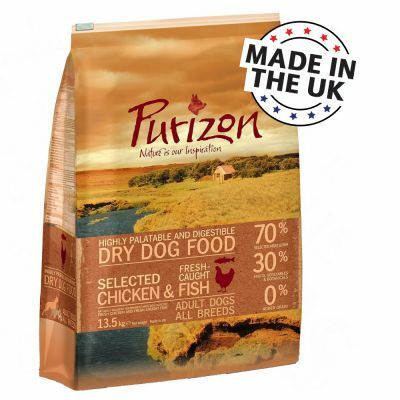 Conclusion: Superb food for your dog and not too bad for your wallet either.